Efficio is a UK-based company which specializes in procurement consulting. They support a variety of clients including blue-chip multinationals, Private Equity (PE) firms and SME clients, helping them drive increased value from procurement. 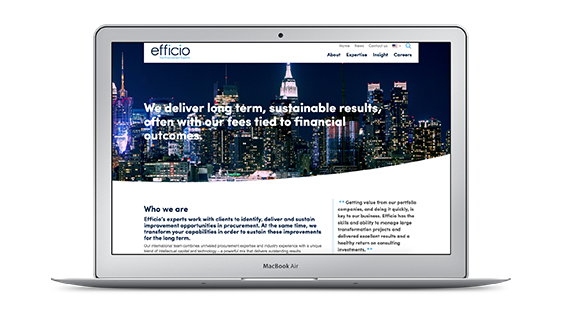 Headquartered in London and represented in Copenhagen, Düsseldorf, Geneva, New York and Paris, Efficio offers a wide range of services from focused consulting engagements to long-term managed services worldwide. The cooperation between Efficio and N-iX began in 2016 when a Dedicated Development Team started providing testing services for the OnTrack procurement app. Later on, the team was extended with frontend and backend developers comprising 10 full-time engineers performing both manual and automation testing and participating in the development of Efficio products. As an integral part of the Efficio’s UK team, N-iX extended team has taken an active part in full-cycle product development, contributing to architectural decisions, backend, frontend, infrastructure and project management methodology definition. N-iX has been in charge of the development of one of the eFlow components – eView. It is a website builder which aims at showcasing graphics and delivering specific content such as text, video, and dashboards for internal purposes. In order to provide flexibility in changing business logic and core components, backend and frontend were separated using REST API and AngularJS. N-iX engineers have also worked on the development of a CSV uploader and a content builder system for reports within eView including TABLEAU integration and SDK development. The team has initiated moving to the cloud, migrating to the microservices architecture and taken many important engineering decisions to ensure the highest quality of the client’s digital products. Efficio is a procurement consulting company which operates on the market since 2000 offering its clients procurement opportunity assessment, strategic sourcing execution, people and process development, procurement transformation, managed procurement services, and much more. 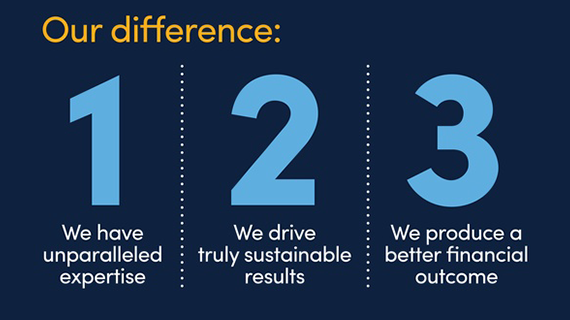 Apart from consulting services, Efficio offers off-the-shelf and custom-built technology applications. They are provided on an ongoing Software-as-a-Service (SaaS) basis to support longer-term value creation, which also increases efficiency during every engagement. eFlow is a proprietary technology platform which enhances the delivery capability for clients. It changes a linear sourcing and contract management process to a cyclical, closed loop procurement lifecycle. As an integrated solution, eFlow supports the entire procurement lifecycle and offers such services as spend analytics, category planning, eSourcing, supplier lifecycle management and performance management. OnTrack, another Efficio product, is a cost management application which provides a central hub within a supply chain to operate, manage and analyze the commercial performance of contracts. Through integration with stakeholder systems and processes, OnTrack becomes the single repository of all comprehensive cost information associated with a spend programme. OnTrack helps to improve commercial outcomes through the automation of definable tasks, forward-looking analysis, substantiated by factual information, enhanced visibility and granularity of spend, value, and performance. One of the challenges N-iX team faced was to develop a content builder system for reports within eView with the help of TABLEAU integration. The idea was to ensure better data visualization and customized report generation, tailored to the needs of various groups of users. As TABLEAU was not adapted to work directly with PHP software instances, our team has developed their own SDK, which was not offered in the network. That has allowed having a separate component which works with Tableau services and can be used for any product of infrastructure. Moreover, one of the decisions taken by the development team was moving to Cloud Solutions. The big data generation has helped to improve consultancy services and used the aggregated feedback received from all the customers. N-iX team has also worked on the development of a CSV uploader, a product which can be used for eView as well as separately to upload and parse files. The aim was to perform CSV uploads with complex business logic on the background. It would help to analyze high volume of data, process it, form reports and collect them to the specific data structures. The product has several levels of validation, like custom XML validation, to ensure flexibility and better quality of the output. For the faster development of background processing, N-iX developers have created a layer which accommodates the work of the engineers. It serves as middleware between developers and complex queuing tasks. In general, it has improved the performance of the whole infrastructure of the products and brought flexibility to the development process. Also, the team has developed the centralized authorisation and permission management service for all internal components to provide user data consistency between them.